So you want to know the trick to baking the softest, chewiest cookies? Just replace a half-cup of the sugar in your recipe with a package of pudding mix. It's that easy! Your cookies will stay soft and chewy, even days after baking -- if they last that long. You can experiment with different flavors of pudding in your cookies, but vanilla is my hands down favorite. And in case you're wondering, there are MSPI-friendly pudding mixes. JELL-O brand makes several -- do check the ingredients very carefully. But one word of caution, these puddings are MSPI-friendly, not safe. There could be cross-contamination during the production process, so only use these mixes if your little kiddo can handle it. Here's my favorite chocolate chip cookie recipe using pudding. It's based on the Ghiradelli Chocolate Chip Cookies recipe found on the back of their semi-sweet chocolate chips packages. I also scale back the vanilla a little bit, since there's plenty of vanilla flavor from the pudding. In a large mixing bowl, beat shortening with sugar and brown sugar at medium speed until creamy and lightened in color. Add eggs and vanilla, one at a time. Mix on low speed until incorporated. In separate bowl, combine flour, pudding mix, baking soda and salt. Gradually blend dry mixture into creamed mixture. Stir in chocolate chips and nuts. Drop by tablespoon onto ungreased cookie sheets. Bake for 9 to 11 minutes or until golden brown. Tip: I highly recommend lining your cookie sheets with Silpat or parchment paper. Much easier to clean-up! Yum Yum Yum! My all-time favorite choc chip cookie recipe has sour cream in it (super-soft), but I couldn't do that while I was doing the MSPI diet. I tried pudding a couple times, and it was really good but too sweet for my taste. I never thought about leaving out some of the sugar. Thanks! 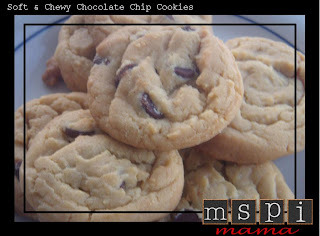 Where can you find MSPI friendly chocolate chips? So far every package I have looked at is a no-no! Any help would be appreciated! My favorite chocolate chips are the 365 brand of vegan chocolate chips at Whole Foods. Also, Enjoy Life Foods' chocolate chips are completely dairy and soy free. There's a store locator on their website: www.enjoylifefoods.com. If your child can handle a small amount of milk through cross contamination, then you might be able to use Ghiradelli's semi sweet chocolate chips, which are available in lots of stores. Hope this helps! Best chocolate chip cookies. Ever. I used soy and dairy free buttery spread instead of shortening, and they are delicious. We've even subbed gluten free flour to make them and they were terrific! Thank you! THANK YOU for this recipe!!! LOVE them. I made them a week ago for my Playgroup, I'm now making them again for myself!